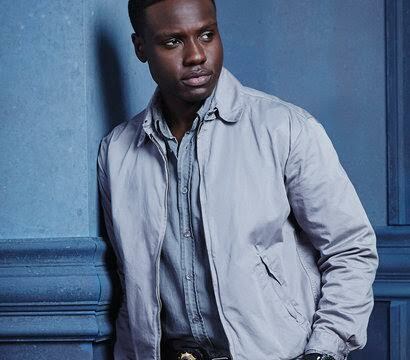 *Dayo Okeniyi plays Michael Loman on the exciting NBC crime drama “Shades of Blue,” starring Jennifer Lopez and Emmy Award winner Ray Liotta. The series follows Harlee Santos (Lopez), a morally challenged NYPD detective-turned FBI informant who is pitted against her own unit, led by relentless Lieutenant Matt Wozniak (Liotta), who often leads the team to step outside the limitations of the law in order to protect the precinct. Loman is a rookie policeman who on the premiere episode, accidentally shoots and kills a suspected drug dealer while he’s playing a video game, and Harlee helps him cover it up. The tragic incident finds Loman struggling with his conscience over the next several episodes, and his unit testing his loyalty, all leading to an explosive decision on tonight’s episode (March 24). EUR/Electronic Urban Report chatted with Dayo ahead of tonight’s episode to gain further insight about the huge moral crisis Loman is experiencing, and what he really thinks of his shady mentor Harlee. Talk about the type of emotional conflict Loman has been struggling with, which lead up to the choices he makes on tonight’s episode? Dayo: He’s a very young, very moral guy. He has great ideas and ideologies of what it means to wear that badge and to be a detective in the NYPD, and of course he comes to the job and very quickly makes the biggest blunder of his life and the question is, is it an unforgivable sin? Can he bounce back from this? Is he a hypocrite if he decides to stay on course and be the good cop that he truly wants to be? Or does he just feel the immense weight of this guilt, and is he forced to give up these ideologies and just go with things as they are? It’s very hard because he’s surrounded by very morally questionable individuals, so that’s really what his struggle is. Can he maintain the great morals he came into the job with, or will he fall down the deep, dark rabbit hole, and become one of the pawns in Woz’s game. In the next two episodes, we get to see what decision he makes. Harlee is a resourceful, corrupt detective who makes selfish decisions, and serves and protects in manner that best protects Woz and their unit. What does Loman really think of her? 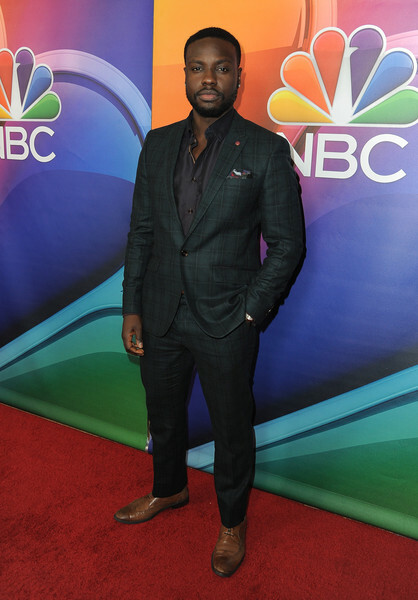 Okeniyi made his screen debut opposite Jennifer Lawrence in the wildly popular “The Hunger Games” film, where he played Thresh. Last year, he was featured in Vanity Fair’s New Wave portfolio and was one of the 30 Under 30 profiles for the Los Angeles Times. Dayo: He’s really on the fence right now, and as much as he kind of despises Wozniak, in a way, he does admire the fact that Woz isn’t trying to be someone he’s not. Woz is very clear about his intentions, even though they don’t tend to be good intentions. I think Loman does admire somebody who is very straight about who they are and what they want. So that’s where he is, in terms of picking who his mentor is gonna be between Woz and Harlee. In the next couple of episodes, that definitely becomes a question for him. Whose side does he choose? 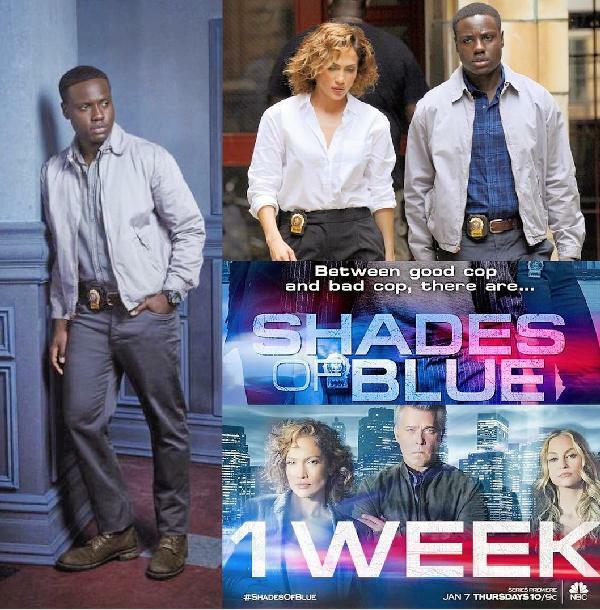 “Shades of Blue” is a thrill because it’s rare that cop corruption serves as the template of a series. What kind of response have you received from law enforcement? Dayo: Honesty? None. I have a buddy out here who’s a cop who’s in the LAPD, and I ran into him after a couple of episodes aired and I thought there was going to be this big conversation about how angry he was. He loves the show! And to be honest, at the end of the day, it’s entertainment. I don’t think we’re going out saying that all cops are bad. But what we’re really trying to say is, these kind of individuals do exist and our show is more about people, and not necessarily about law enforcement in this country. But people like this exist in all fields of life. Our show just happens to take place in a precinct. Are there corrupt cops out there? Absolutely. But just as much as there are corrupt cops, there are great cops and there are good people who are putting their lives on the line to make this country a better place. During research for your character, did you talk to cops who are dedicated to their job, and are aware of the corruption, but they must remain silent because they have more to lose than there is to gain? Dayo: Definitely. I spoke to cops and to be honest, I thought they would be like, ‘The idea of corrupt in law enforcement is ludicrous.’ Not at all. They were very open about. Cops don’t necessarily make a lot of money, so are there cops out there who go down the road of corruption? Absolutely, but they are a cancer and they need to be cut out. So that’s a lot of the stuff that I was getting. A lot of them spoke very highly of law enforcement but they never once denied that there was corruption. If anything, they were about weeding the corrupt cops out. No one goes into law enforcement expecting to be put side by side with people who are doing bad things. How has working with a cinematic legend like Ray Liotta and a cultural icon like Jennifer Lopez, helped to shape the way you approach your craft? Dayo: You can’t go to work not prepared cause these guys are seasoned, and if anything l leaned the most from both of them is, question every motive, and I love the curiosity of that. They’re both very curious, and you’re right, they’re legends. So when you show up at work, you shut up and pay attention, cause maybe you’ll learn a thing or two. 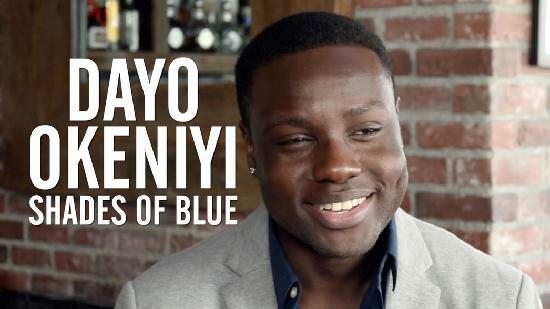 Be sure to check out Dayo’s big moment on tonight’s episode of “Shades of Blue,” which airs Thursdays at 10/9c on NBC. Catch up on full episode here.